Tradition, untouched landscape and a lot of regional delicacies - that is what distinguishes Ofterschwang. 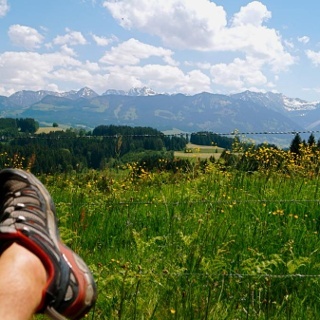 Enjoy a circular hike through the beautiful landscape of Ofterschwang. On the way you can visit both our alpine dairies in Hüttenberg and Schweinberg as well as the organic bakery in Westerhofen. As a tip we recommend a regional "Brotzeit". Ofterschwang offers many delicious homemade products from honey to cheese, bread, herbal products, sausages and much more. You start the hike at the Ofterschwanger Haus, at the valley station of the Weltcup-Express. Leave Ofterschwang over the beautiful nature trail in the direction of Hüttenberg. There you can enjoy the different impressions of nature. The path leads along Bettenried, where the Bächle-Waibel herb garden is located. Waltraud Bächle-Waibel produces many herbal products from herbs, fruits and berries such as Marigold cream, holder liqueur, wild garlic oil, herbal teas, jams, etc. Follow the nature trail to Hüttenberg. The mountain dairy prevails in this district. The well-known Bergbauern-Sennerei Hüttenberg is supplied with milk by all Hüttenberger farmers who work together in a cooperative and can thus produce the delicious cheese in their own production. Here you can buy genuine Allgäuer mountain cheese, herb cheese, butter etc. or take part in a guide through the dairy, which is always held on Thursdays at 10.15 am. From the village center of Hüttenberg, you will have a wonderful view of Sonthofen and surroundings and head down to Westerhofen. Here you will find the organic bakery Kornblume, another local producer in Ofterschwang. The bakery has a small cozy café, where you can taste tasty whole-baked and organic breads of all kinds. In the village center you will find a small and cozy village square with a herbal spiral and seating for resting. 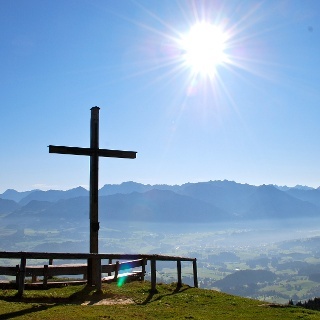 Continue your tour behind the chapel through the forest in the direction of Schweineberg, where you can hike between the tree giants in a quiet and idyllic atmosphere. 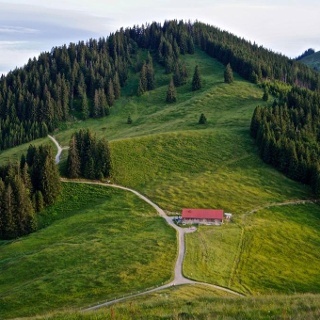 On your way to Schweineberg, take a small stop on the Wittelsbacher Höhe, a scenic hilltop with an old tree ontop. 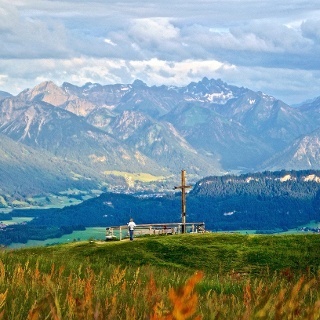 A breathtaking panoramic view of the entire Illertal valley awaits you here. 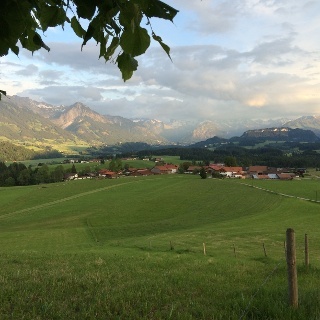 From the Wittelsbacher Höhe you follow the path over green meadows and you reach Schweineberg. There you will find another alpine dairy. In the alpine dairy Schweineberg you can participate in the alpine dairy every Tuesday at 10.30am. The products are all made exclusively from genuine Allgäuer mountain milk. You can stop at the Bauerngasthof Café Mayr, which has a lovely terrace and tasty local cuisine. From Schweineberg you can take a detour down to the Hotel Sonnenalp Resort and head into the Tiefenberger Moos (bog), or go on towards Wielenberg, back to Ofterschwang. 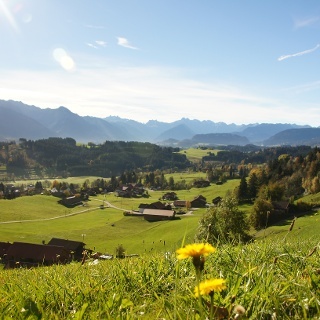 On the way you will cross forests and meadows from which the bees produce healthy and tasty Allgäu honey. The excellent honey of our various beekeepers in Ofterschwang is available in the village shop in Ofterschwang. The Landhotel Alphorn is located directly at the village entrance. Here you will find Jörg Pöschl, enthusiastic alphorn player and an eager fan of local produce. Together with his team he stands with full conviction behind the local products of Ofterschwang and also uses his own herbs from the garden for tasty dishes. 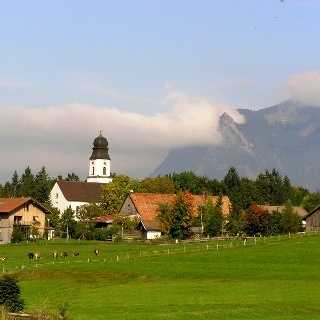 The last stage leads past the church of St. Alexander down into the village center to the ice cream parlour in Ofterschwang. The ice cream parlour only uses fresh milk from the mountain dairy Hüttenberg for its creative ice cream varieties. Even the other ingredients are regional as far as possible, or at least from organic cultivation or Fairtrade products. From the parlour it is only about 400m to the starting point - the valley station.